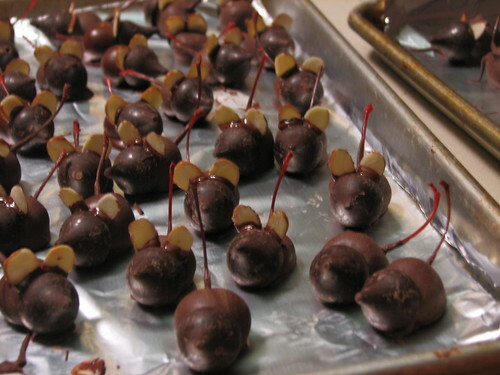 The bodies of the mice are made from maraschino cherries dipped in chocolate. I drain and rinse the cherries and leave them on paper towels for 30 minutes to an hour, changing the paper once. They need to be fairly dry before dipping in chocolate. The stems become the tails. When dipping, totally seal the area of the cherry at the base of the stem. Don’t dip the entire stem in chocolate. 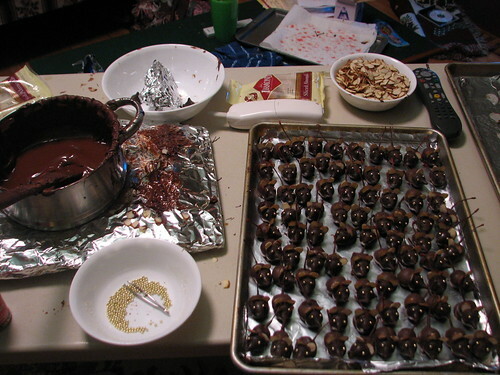 While the chocolate is still soft, add the heads (Hershey’s Kisses) or, if the chocolate hardens, you can dip the bottom of the Kiss in chocolate and stick it to the body. 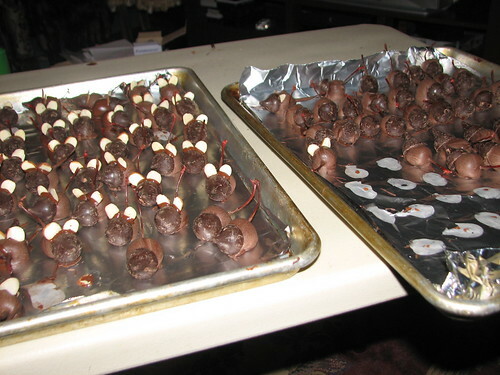 The ears are sliced almonds, dipped in chocolate and set behind the head. They can be added while the body chocolate is still soft, but the timing is tricky. Too soft and the ears slip down the sides. Too hard and they don’t stick at all. I find it easier to attach all of them at the same time. I break an almond slice in half, dip the broken side in chocolate and attach it just behind the head. In this picture you can see the set up. The pan of chocolate sits on a heating pad that has been wrapped in a towel and covered with aluminum foil. The gentle heat from the heating pad keeps the chocolate melted. The almonds are in a bowl for easy sorting. 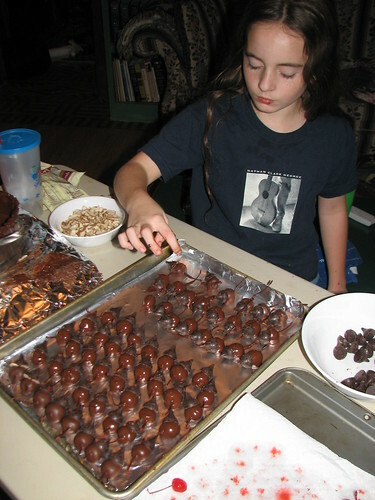 The dragees are attached by holding them with tweezers, barely dipping them into melted chocolate. They easily stick to the head (Kiss). I smear a small bit of chocolate on the aluminum foil which keeps the chocolate soft, and also gives me a perfect spot for dipping the eyes without immersing them too deeply into the chocolate. If you find the dragees do not stick well, set the tray of mice in the refrigerator for five minutes or so. When the melted chocolate touches the cold Kiss, the eyes will adhere immediately. Do check the jar label. Some maraschino cherries have stems, some don’t. We live in a small town and can’t always find stemmed cherries locally. Larger grocery stores with more variety are an hour away. I sometimes pick the cherries up in the summer or fall before Christmas so I have them when I need them. Try creating your own Christmas mice! 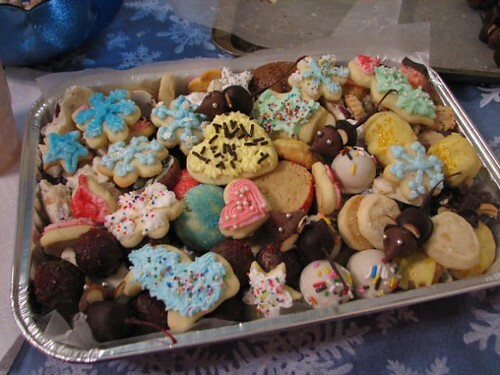 They are fun to make and look cute on the cookie tray, as you can see in this picture of cookies packed for the volunteer firemen. Boxes also go to the police station, the staff at DD’s school, and others. This entry was written by ~~Rhonda, posted on December 15, 2007 at 12:30 pm, filed under candy, Christmas, Recipes and tagged candy, Christmas, christmas mice, open house, recipe. Bookmark the permalink. Follow any comments here with the RSS feed for this post. Post a comment or leave a trackback: Trackback URL. The Christmas mice are so stinkin’ cute! Just kidding, but they do look scrumptious! Thanks for the step by step instructions and pics. I had made these for my grand-daughter’s birthday when she had a Minnie Mouse party. But I had forgot exactly how it was done. You might try these using white chocolate. They are great for halloween they look like lab rats. I use pink for the eyes. These are soooo cute. My mom made something like this using Oreo cookies, but I don’t remember how she did it, I will definitely make these up, and the white chocolate is a great idea for halloween, you could use the swirl Hershey Kisses for the head, or white chocolate tinted pink for Valentines Day, if we could get Hershey to make a white chocolate kiss, lol. Thanks for posting the photos, it makes it so much easier to follow. Barbara, they would be cute as white mice! Here’s a link for white meringue mice. I’d love to try these some day. I make these every year too. However, I untwist an Orea Cookie and make the mice on the cookie base with Oreo filling still on it. The mice look like they are sitting on snow and it gives them a good base so that they are not as delicate to handle. I also take red and green icing gel and put a little holly and berry design on the “white snow”. Does anyone know where you find (store) the triangle shortbread that you set the mice on? These really are adorable. I found years ago that the almond ears are very easily broken when you try to cover your pretty cookie tray with plastic wrap. My solution was to make the ears from pink bubble gum. I use a sharp metal cookie cutter that has a small semi circle – mine just happens to be an angel’s head. I stack up two strips of bubble gum tape and press through them with the cutter (kids could easily do this part). That way, I have a pair of ears together when I get ready to apply them to the head. The pink is colorful and the ears won’t break. Really cute. If I skip a year and don’t make them, I get lots of whining and complaints. The only thing that surprises me is that there are not more raving comments. I had never seen these little creatures before. The waitress in this charming Victorian restaurant brought one out to me when she found out it was my birthday. I find them so enchanting that I can’t wait to give it a shot. Thanks for your implicit instructions………..I’ll let you know how they turn out. Rhonda: I’ve never seen such a thing as Christmas mice, but they are absolutely adorable. Can’t wait to try them and add to my Christmas tray. Rhonda, a friend made these for Holloween one year, and they were so cute. 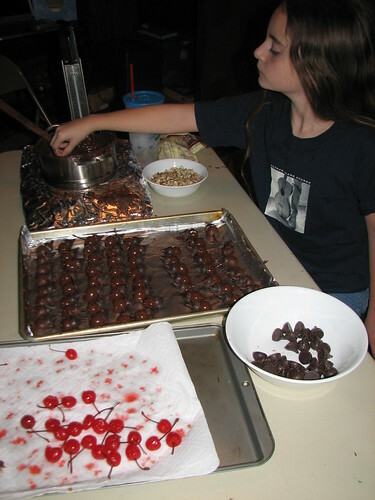 I am making some for my grandchildren on Holloween, but I like to use the regular chocolate ones. I am going to put them on mice traps, you know the cheap kind that you find in the Dollar store. I will just take off the part that pops. I think they will be so cute and the kids will be able to handle them. Very nice!!! I like mice! The first time I saw these mice the person had put them in a shoebox. When you peak inside they look real. Scared the s*** out of me. But they tasted so good. Plus you don’t have to worry about putting plastic wrap over them and breaking the ears. I have been making these for a long time and I always use the white bark for Christmas time and then place them on my tray of candy for gifts. They are a hit for sure. I purchase the small tubes of icing in pink for the eyes and make a green wreath around the neck and then make three red dots at the top for the holly berries! They are precious. This is a great idea, I will be sure to give this a go with my children (Christmas or not! ), thanks for making it easy to follow too. I live in California so can’t purchase the silver dragees in our state- got them in New York 1 1/2 ago. What size did you use? I’m going to make these tomorrow to take to the annual awards banquet for all the garden clubs in STL on Thursday. My home-schooled jr. garden club kids loved these last year. Remember when we toured your yard & craft room? They loved it. So did the moms!! I have made these before using only a picture that a friend took of his mothers. She used pink piping frosting for the eyes and nose. Everybody loves these!! I get requests all the time for these little critters! Some eat them in front of people who think they are real…so funny to see the reactions! Oh…I also melt the kisses so that the body and the head are the same color chocolate! Made them once and they were two toned cuz I didn’t pay attention to what chocolate I picked up. How would I store these so I can make them at home and travel with them? Neat idea btw!! These are adorable, and look like they could be so much fun! I have made them with two kisses together, but the cherries are a much better idea. Lovely post, and featured on our site for christmas. I designed a “Charming Tails” (the cute little mice) theme for a local Red Hatters club and was trying to figure out what to do for some treats – these are perfect! 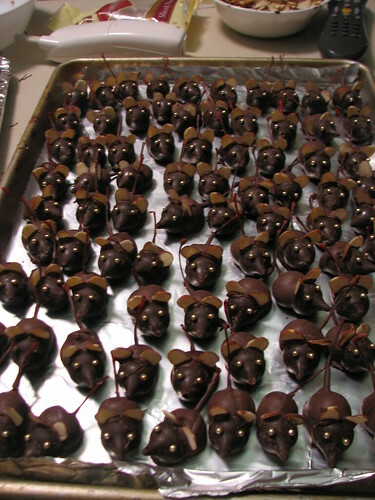 I saw this picture of the chocolate mice and fell in love, I love making editable animals for desert and these are absolutely darling!!! Thank you and am excited to make these for Christmas this year, thank you so vert much *❤* they are adorable !!!!! I set these around my cheese tray! The chees is stacked so allows for room to cover the mice and cheese without breaking the ears. I use a xmas gift box and red or green tissue paper scrunches up in balls and then into a box. I then wrap the box with sarah wrap or foil either one. One grand daughter wanted me to make thirty for her class one year. I have fun decorating them all different if time allows.